Manchego was traditionally made from native sheep milk pastured on the high central Plateau of Spain. It's probably the single most known cheese coming out of Spain (but that's just because we are not familiar with the other terrific cheeses from Spain). I often ask my workshop attendees to name for me, 3 Spanish cheeses and that almost always ends at Manchego. Manchego comes from an area that is so hot and dry much of the year, that only this special breed of sheep can coax the nutrition from the dry grasses. Not surprisingly the breed of sheep used to make the cheese takes its name from the land as 'Manchego'. It was the Muslim community who inhabited the land from the eighth through the eleventh centuries and dubbed it region Manya, which meant "land without water”. If visiting Spain you will also find many other cheeses similar to Manchego, such as Zamarona (made in a different region and breed of sheep), as well as the many Manchego-like cheeses I see made from ewes milk but outside the classified Manchego region. They all show the typical zig-zag markings of the traditional plaited 'Esparto' grass forms, a well expected signature for this style of cheese. In my travels through the cheese lands of Europe I do taste a lot of cheese but I must say that some of my favorites are those made from Ewes Milk. Unfortunately where I live here in western Massachusetts there is little milk to be found ... lots of sheep but all for fiber and milking is not something the farms will do. So when I make these it is normally a long trip well up into Vermont for any milk. August 2016 I taught a workshop in PA where they brought in some ewes milk from a local Amish farm for this. The Manchega sheep’s milk has higher fat and protein than other milks as well as more solids (and less water) than cow or goat milk and this tends to be a very unique and different texture from that of cow or goat milk. 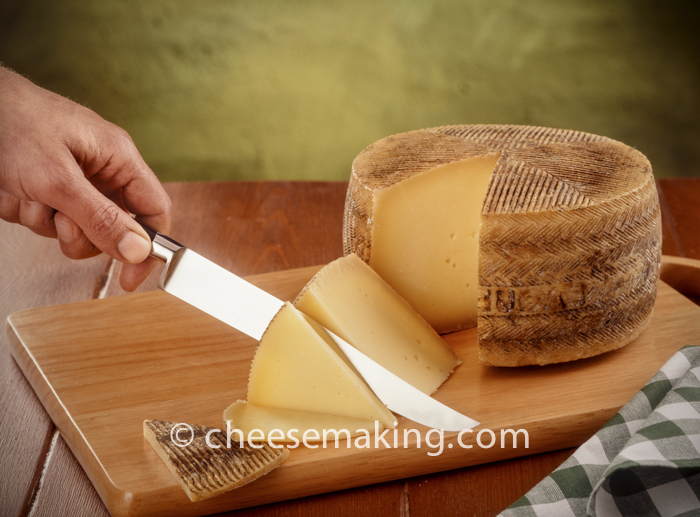 Manchego can be made from either pasteurized or unpasteurized milk. The raw milk produced on small farms is considered to be an artisanal cheese. For those not familiar with Manchego it is a hard buttery tasting cheese with a silky texture from the higher fat of ewes milk. In the mouth it reveals the creamy richness of sheep milk and a flavor that lingers on the tongue. It has a compact interior but quite brittle like cheddar which will break and crumble if bent. It shows a rind with the cross hatch marks to represent the traditional plaited grass molds. Most of these are now made of plastic but this distinction is important and probably some of the best branding of any cheese in the world. The surface tends to be a dark cream color for the younger commercial cheese but a grey/black surface in the more traditional and longer aged cheeses. The aging process is conducted in high humidity natural caves for a minimum of 60 days. In April of 2016 I spent most of the month in Spain, beginning with the Spanish National Cheese Festival in Trujillo 'La Feria del Queso' and then visiting cheese makers in several cheese making regions in the west and south of Spain. I had understood that much of the cheese making in Spain is still done in very traditional ways even being carried into the smaller commercial operations I visited. Such things as using the traditional 'Esparta' grass straps as forms, using traditional 'vells' for rennet (photo on the right), and pressing by hand with light weights or using stone weights for pressing. These were things I found to be quite common and a mutual respect for this traditional production was very evident in my travels. I had come to realize that Franco's Spain made small scale artisan cheese making on the farm illegal and did not recover from this until the late 1980s. So farm scale cheese making only existed as a clandestine affair for a long time. 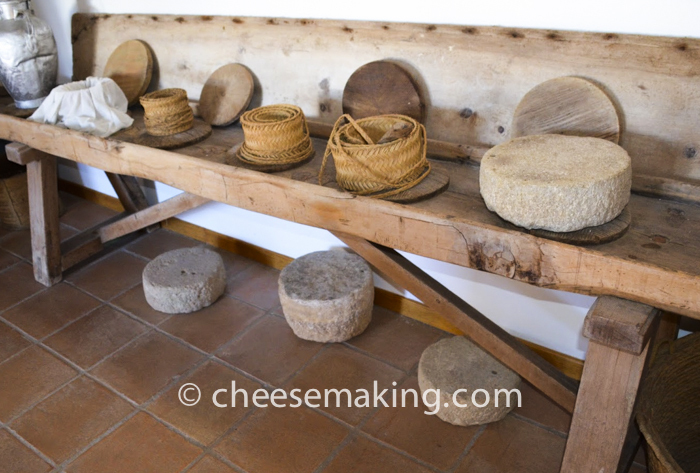 Therefore traditional cheese making in Spain today is a true snapshot of what cheese making was like 50-60 years ago before the gross commercialization of cheese. I had taken several workshops with Enric Canut and gotten to know him at the University of Vermont's VIAC program. Enric is considered to be one of the most knowledgable promoters of Traditional Spanish cheeses and their history and an incredible resource. 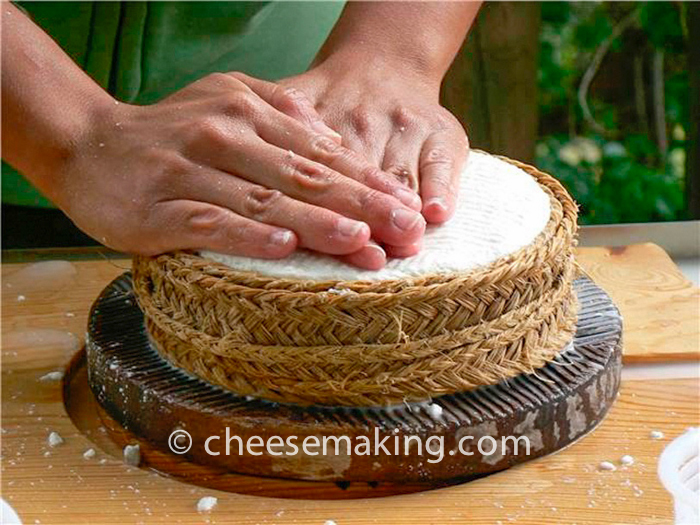 I love the traditional forms that used to be used for making cheese and the beautiful designs imprinted by them. A plaited grass strap had been used up through the early 20th century in much of Spain and I wanted to find someone still producing them, something I was quickly told I would not find but my persistence won out in the mountains of Grazalema. Spain has maintained its pastortal highways known as the 'Dehesa'. These are open pastures that are off limits to all but the herds moving seasonally for richer grazing. These are still marked off and can be seen as empty spaces on todays maps. In talking to many of the shepards they are not used as much these days but I still saw much of this traditional sheparding on a daily basis in the La Mancha region of south central Spain. I really wanted to talk with the shepards and learned more about this, its past present and future. Manchego cheese making has taken place in this region for thousands of year. Archeologists have found evidence of Manchego cheese production from before the time of Christ when the Iberian peninsula (continental Spain essentially) was still in the Bronze Age. Other references appear in Cervantes 17th century novel of Don Quixote, Sancho Panza and tilting at windmill fame (still evident on the landscape as shown above). The early producers of the area were milking the ancestors of what is now the Manchega sheep breed. They have evolved over the centuries to survive the very arid conditions with harsh grazing conditions. These conditions actually account for higher fat than we might expect in the final cheese and hence the richer flavor of Manchego. The La Mancha plains were also a focus of political dispute for centuries between Northern Christians and Southern Muslims, who fought for control of its pastures. The Muslims who inhabited the land from the VIII through the XI centuries dubbed it Manya, which meant "land without water”. Eventually, that would translate into Mancha, the name that is used today. King Alfonso VI conquered and united the region in the XII century and forced the Muslim inhabitants to retreat to the Andalucía region of modern day Spain. The resultant lack of political stability led, by the end of the century, to the organisation of the area's stock farmers into co-operatives, which in turn brought a stronger regional identity and political and economic power to the agricultural inhabitants. By the 1600s the efficient use of pasture land led to the decline of stock-farming and the rise of land farming. By the middle of the 1800s wool production was in decline and as a result cheese and meat production grew. So much so that by the beginning of the 1900s cheese production dominated the economics of the region primarily with the Manchega sheep supplying the milk. As it grew, the demand for the cheese increased to the extent that larger coops and commercial enterprises developed. However, the demand for Manchego has resulted in industrialisation of production and consequently to a great extent, a loss of quality. Beginning during the Franco period post WWII, traditional cheesemaking throughout Spain suffered a severe set back when the government directed all milk to the large industrial cheese makers. It was not possible for small farms to make and sell their cheese. Fortunately a few brave soles went underground with their milk and cheese and some of the procedures survived this dark period but it was not until the late 1980s and well into the 1990s that small scale farmstead cheese making has shown as a true revival. Cheese that has been made for centuries comes with its own list of traditions that made it what it is today and I found that the people in Spain still hold these traditions in the highest regards whether it be their Jamon, Queso, Vino, or other products related to the land. The people I met in Spain, whether living urban or rural, all seemed to show a great respect for the past. My research in Spain had been inspired because I feel it is important that we tie these wonderful animals, the land that supports them and the people that make their incredible products together for a more sustainable picture of what sustains us. The traditional breed of Manchega sheep, mostly because they have adapted to the arid region. These sheep are quite recognizable by a prominant high ridge above their nose. The pastures that are recognized as the 'Dehesa' are marked out and shown even on modern digital maps. They were originally mapped out for moving the animals to higher and more nutritious pastures hundreds of years ago. Traveling through La Mancha I would see the sheperds moving the flocks both early and late each day. This land is also where the famous 'Black Footed Pigs' known for their famous Jamon still graze on acorns. These pasture highways are so respected even today that the huge city of Madrid stops traffic and allows this Transhuminance or migration of thousands of sheep through its main city streets every year. In the Spring these pastures are alive with wild flowers but whither up into the dry grass of summer where only the Manchega sheep do well on this. This is a logical and natural way of of using this land which makes it totally sustainable into the foreseeable future. Finally the process of making the cheese, although it is changing with commercial pressure still has full respect of the consumers. The rennet was originally produced on the farm either from the natural stomach linings of the sheep and in some areas where the sheep were not butchered frequently, the use of the Cardoona (thistle) flower was used as a source of enzymes for coagulation. Also for pressing cheese, a simple rock was all that was required. I still see this method quite often on the traditional farms. No need for an expensive press and weights for the past generations. Even the forms that were traditionally used in Spain showed an incredible amount of craftmanship. 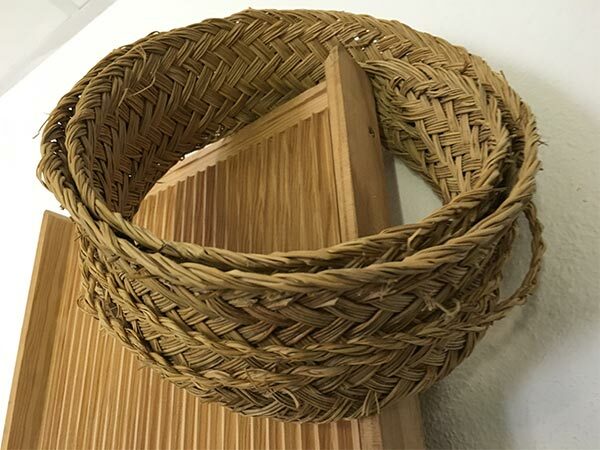 They were traditionally plaited as long straps from a native grass called 'Esparto'. These were then formed into a circular form to accommodate the amount of curd from the milk which was then hand pressed into these form. 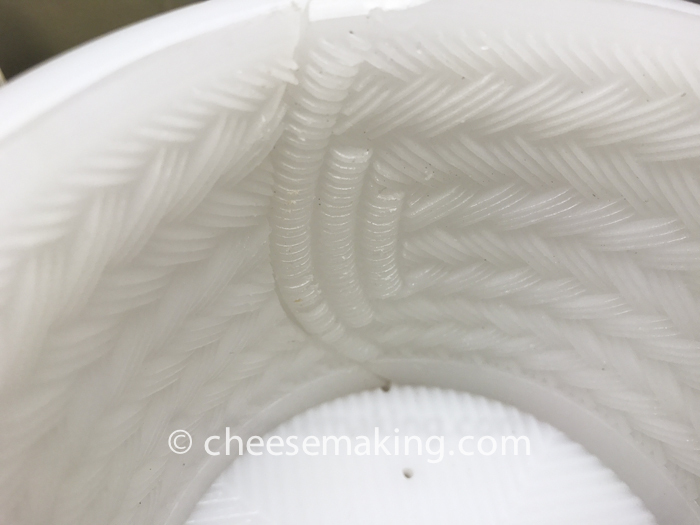 Not only does the grass wick moisture from the cheese, but it imprints a zigzag pattern on the sides due to the way they are plaited. This is perhaps one of the oldest example of 'Branding' a product I have seen. I was told that the forms I was seeing at first were old antiques and not used today or even available. I did eventually find a shop owner that had a village elder make a few every year for her and she was thrilled that an American knew what they were. 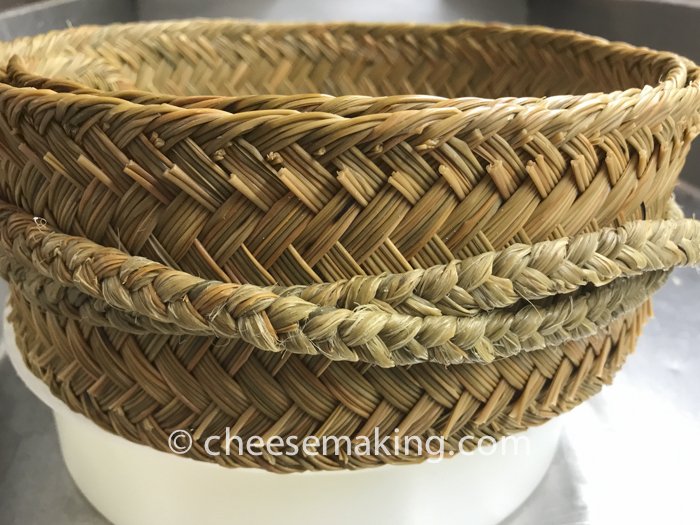 Of course, this is how it was done traditionally; in large production Manchego production today they no longer use an esparto grass mold but a plastic molds that is designed to imprint this traditional pattern on all Manchego cheese.